Born c. 1922, in North Carolina; daughter of an automobile mechanic/entrepreneur and a seamstress; married once. Education: Graduated from Brooklyn College, mid-1940s; earned law degree from St. John’s University Law School, late 1950s. New York City Department of Welfare, social investigator, mid- to late 1940s; New York City Children’s Court, probation officer, 1950-59; criminal attorney in private practice, Brooklyn, NY, 1959-65; Harlem Youth Opportunities Unlimited (HARYOU), founder of Legal Services to the Poor program (never implemented), 1965-66; worked to defend family real estate claims in North Carolina, 1966-68; New York University Law School, supervisor of graduate Volunteers in Service to America (VISTA) program, 1968-69, minority student advisor and law instructor, 1969-73; defense attorney for members of the Black Liberation Army, 1973-79; Harlem Legal Services, New York City, executive director, 1980-81; attorney in private practice, New York City, 1980-84; City College of New York (CCNY), instructor in family law, 1987-89; Stevens, Hinds & White (law firm), attorney, 1989–. 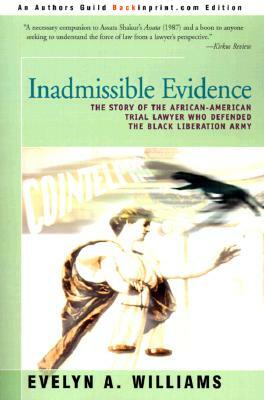 Esteemed civil rights lawyer and activist Evelyn Williams dedicated her 1993 autobiography to her African ancestors and her more immediate family, “all of whom have waged their own struggles against the multiple facets of racism that continue to structure the world,” she wrote in her autobiography entitled Inadmissible Evidence. The attorney and author also honored “all political prisoners, wherever they are confined within the mirrored noon of the dead.” Williams had entered a fierce legal battle defending her niece, Assata Shakur, 20 years earlier. The young woman encompassed both groups cited in the dedication: she had inherited the strength of the generations behind her, and was using that power in a determined struggle in an attempt to reverse the entrenched systems of African American oppression. Williams was born to North Carolina parents in the early 1920s, the second of two daughters. Her father had attended college, and her mother had finished high school; when incidents of organized racism common to the South–as well as the infamous night rides by the Ku Klux Klan–grew in frequency in their area, they decided to head northward. The family settled in the New York City borough of Queens, and while Evelyn and and her sister Doris attended school, their father worked a series of odd jobs during the Great Depression while their mother worked in a garment factory. Nevertheless, Williams grew up in relatively comfortable surroundings–her parents owned an automobile as well as valuable oceanfront property in North Carolina, and were savvy enough with the little money they earned during lean times to keep Williams and her sister clothed and fed. Their parents also stressed the value of education and a pride in one’s heritage. “My parents provided my sister and me with a formula for survival with dignity. They taught us from the earliest age never to lower our eyes when we spoke to white people, and they carefully avoided exposing us to the media- generated stereotypical behavior of black people so negatively portrayed in everything created allegedly to entertain us,” she wrote. Williams spent four years at the job, but decided to become a juvenile probation officer for the city in 1950. This, too, offered little little satisfaction: the delinquents and their families, the surrounding community that had brought them to her, “all poor and all defeated by the mere process of existing in a society that had failed to touch their lives except with rejecting hands–made it impossible for me to feel any gratification from the small results I was able to achieve.” Williams enrolled in St. John’s University Law School, located in Brooklyn, in the early 1950s. When Williams earned her juris doctor, she was one of two African Americans in a class of 154. During her dual career as a law student and social worker, she became involved in a high-profile case involving the children of Ethel and Julius Rosenberg, two American Communists executed in 1953 for espionage. The parties involved–the New York City Department of Welfare, the young boys’ grandmother, and a married couple who were friends of the deceased with whom the boys were then living. At the request of the New York State Supreme Court, Williams investigated the parties, made extensive visits to the boys, and battled the political maneuvering of the court system to come to a decision that was in the best interest of the already-traumatized children. Williams was admitted to the New York State bar in 1959 and began practicing criminal law, hoping to defend the poor, the uneducated, and the oppressed who could not otherwise afford legal representation. The idea of a public defenders’ office–through which the court assigns attorneys to defendants who cannot pay for an attorney–had not yet been instituted in New York. Some cases were handled for free by the Legal Aid Society, but many were taken by white lawyers who sought out African Americans at the Criminal Court Building. “These lawyers took any small amount of money such people had, filed a notice of appearance in court, and pleaded them guilty. Legal representation was a shabby and indifferent process,” Williams wrote in her book of the system at that time. She set up an office with another female African American attorney and hired a male secretary, and stayed in private practice until 1965. It was during this period that her older sister’s troubled teenage daughter came to live with her. Joey, as Williams called JoAnne, was an artistically gifted, intelligent and questioning teenager who had chafed at authority from an early age. By 1967 Joey had enrolled in college and had channeled her energies into political activism. Soon she was being arrested for demonstrating for an expansion of a black studies curriculum at her college. Williams had given up private practice to set up a legal services program in Harlem under the auspices of African American Congressional representative Adam Clayton Powell, Jr. In 1968 she became a supervising attorney for another pilot program, the New York University (NYU) Urban Affairs and Poverty Law Program. The next year she was appointed minority student adviser for NYU’s Law School. As Williams became more and more involved in working for change within the system to fight racism and institutionalized prejudice, Joey became increasingly involved in battling it from another angle. Her political activism led her to a radical group called the Black Liberation Army. According to her autobiography, “I understood when a new generation of African Americans grew impatient with years of theoretical progress,” Williams reflected about her niece’s political activism during this period. “I thought about the racism that had eroded the socialization process for African Americans, a process that is essential for all humans because it provides the structure within which all behavior is fashioned.” While worried about Joey’s activities, Williams nevertheless trusted and supported her niece’s decision. For two years, Williams and her family were surveilled by the FBI and lived in fear that Shakur would be killed in a shoot-out with police, as some other members of the BLA had been. She was captured and taken into custody in early May of 1973. Williams quit her job to become Shakur’s defense attorney as authorities began issuing a barrage of criminal charges against her and other BLA members. The first order of business was to attend to Shakur’s medical and legal rights–she had been shot when arrested and Williams’s family feared that she was not receiving proper medical treatment. Ten shotgun-toting New Jersey law enforcement officers were guarding the entrance to her hospital room. At first Williams was not permitted private conferences with Shakur in order to plan a defense strategy. This was one of several fundamental constitutional rights that Shakur was denied and Williams fought to achieve over the next few years. For some of her incarceration Shakur was kept in a constantly lit, solitary confinement cell where her every move was recorded by observers. In the New York and New Jersey trials that began in 1973, Williams defended Shakur successfully on a number of trumped-up charges whose aim seemed to be the defusing of the political threat posed by the BLA. Shakur became pregnant during her incarceration by a fellow BLA member and co-defendant in one of the trials, and Williams battled to get proper and consistent medical treatment for both mother and child. The baby, born in September of 1974, was removed from the prison and custody granted to the maternal grandmother, Shakur’s mother and Willams’s sister. At one point in the series of trials, prosecutors had obtained a sketchy image of a suspected female bank robber thought to be Shakur on a bank surveillance photograph. Shakur’s appearance was now different because she had begun wearing her hair in an Afro. The judge in the case ordered that she be photographed by federal marshals and this was done by force. They brought her into court, held her down, and pulled the hair back from her face, while Shakur resisted valiantly. Williams filed a motion to have the judge removed from the case, but fortunately the new judge declared the forcibly taken photographs to be inadmissible as evidence. One judge threatened to have Shakur bound and gagged, and ordered the case to proceed without her present. Williams refused to continue with the trial unless her client was in court–another basic constitutional right for those accused of a crime. The case ended in a mistrial because the jury was deadlocked. In early 1975 Williams served a ten-day prison sentence for contempt of court for refusing to proceed as Shakur’s attorney when the defendant was not allowed to be present in court. Williams was taken to the jail in handcuffs and imposed a hunger strike on herself for the duration of the stay. Other incidents happened during Williams’s defense of her niece that demonstrated the brutal nature of the campaign against Shakur, the BLA, and their legal representation. In May of 1975 Williams attempted to enter a courtroom where a jury was being selected for one of Shakur’s trials–one at which she was not acting as defense attorney–and conferred with a court officer who would not let her past the door, even though such proceedings were normally open to the public. Without warning the officer attacked Williams, tried to strangle her, and had to be restrained by others. Yet Williams was immediately arrested, strip-searched, and held overnight. In the morning the spurious charges against her were dropped. Later that year, Shakur was found not guilty of the kidnapping of a Brooklyn drug dealer. It was learned during the course of the trial that he was an informant for the FBI. In January of 1976, Shakur was acquitted in the bank robbery case. In November of 1979 Williams learned from news reports that Assata Shakur had escaped from prison. Once again, her niece was a fugitive from the law. Meanwhile, in June of 1980, Williams took a position as executive director of Harlem Legal Services. In this capacity she helped tenants and community organizations in protracted battles with landlords, developers, and a hostile city administration. In some instances Williams filed suit against government authorities in apparent collusion with developers to raze Harlem buildings in a process known as gentrification. Battles with a hostile board of directors–who issued such memos as one forbidding use of the office copy machine without their permission–eventually forced Williams’s resignation. She again set up private practice in mid-1981. Assata Shakur finally telephoned Williams in 1984 from Cuba. Williams and her sister made several journeys to the island, eventually leaving Shakur’s daughter, Kakuya, there to finally be with her mother on a permanent basis. Williams attempted to move on with her life and continue her career as an attorney engaged in the struggle to win justice for those of limited means. Williams’s defense of her niece had made her a target of harassment for years, but she herself was not prepared for what happened next. She had hired a full-time receptionist, a local community activist in Harlem, and spent much of her time absent from the office while in court. In 1984, she learned that the woman, Glenda Robinson, had been using the office for cocaine trafficking. Additionally, the FBI had also put intercepts on the office phone lines, so that callers received a busy signal or a recording that the line was disconnected. Calls to the phone company did not remedy the situation. A client, who had also been a regular purchaser of cocaine from Robinson, helped Williams decipher the mysterious circumstances when Robinson allegedly left town suddenly because of a death in her family. As Williams disclosed in Inadmissible Evidence, “Unknown to Glenda, the supplier [who was to deliver a large amount of cocaine to the office] refused to complete the transaction, telling my client either that I was being set up by the FBI for a major drug bust or that he was, and he ordered my client to stay away from the office that day. As he talked, the pieces fell into place and I realized that I had been the target of a major FBI sting operation, saved only by the street smarts of the supplier.” In her zeal to sell drugs from the office, Robinson had been diverting real business away from the office. This decline in real clients, combined with the mysterious interception of calls, effectively put Williams out of business.